There are few fan bases as embattled as the New York Jets, but they love their football team anyway. The Jets no longer have to play football in a stadium named after another team as they’ve been playing games at MetLife Stadium since 2010. Even though it’s located in New Jersey, MetLife represents both New York City area football teams. Jets tickets are easier to come by than Giants tickets, but the Jets faithful are just as loud as any fan base in the league. Given that MetLife Stadium is a relatively new stadium, the experience is fresh and the food is some of the best in the league. Given the mixed success of the Jets in recent years, there are tickets available directly from the team on the primary market. You can buy tickets through the Jets either online with Ticketmaster, via phone, or at the MetLife Stadium box office. Normally the only tickets available on the primary market are in the 300 (aka Upper) level, the highest one in the stadium. Ticket prices in the 300 level generally range from $66 to $122 but this changes every year. The Jets don't vary their ticket pricing based on the opponent. If you’re looking for better seats, you’ll have to hit the secondary market. Obviously, you have the well-known options like Stubhub and the NFL Ticket Exchange or a ticket aggregator (think Kayak for sports tickets) like SeatGeek and ‎TiqIQ. he Chase and Lexus Clubs on the Mezzanine level offer more comfortable seating and access to a lounge with upscale food options, but you have to pay for your own food. There aren’t really any bad seats in the house across all of the 82,556 capacity, although you’ll be forced to stand up a lot in the lower level corner and end zone seats as fans in front of you do the same to get a better look at the action on the other end of the field. It's very easy to get to MetLife Stadium. Most people are used to driving to the Meadowlands Sports Complex, where MetLife Stadium is located. It’s pretty easy to find as the New Jersey Turnpike or Route 3 will get you there. Should you drive, don’t forget that you must have a pre-paid parking permit. (If you forget to buy a permit, you’ll have to park off-site and take a shuttle bus to the stadium.) You can purchase one on Ticketmaster that gives you access to any Orange Lot (Lot P and all lots near the IZOD Center). You can also go to StubHub or Ticket Exchange to buy parking passes to improve your situation. You generally want to park as far away from the stadium as possible, since it’ll be easier to get out when the game ends. ​The area to focus on are the southern portions of Lots D, E, F, and J. There are also two public transportation options. Your first option is to take the Coach USA “351 Meadowlands Express.” The bus leaves from 41st Street between 8th and 9th Avenues and not from a gate inside the Port Authority Bus Terminal. You can buy tickets inside the Port Authority Bus Terminal, but there is also an operator selling tickets on the street near the bus. Getting out of the stadium isn’t bad as the bus has direct access to leaving the Meadowlands Sports Complex and each bus leaves as soon as it’s full. The second option is to take New Jersey Transit. A train service runs from Hoboken to the Meadowlands starting three and a half hours before the game starts and for one to two hours after the game ends. Those in Manhattan can either travel from Penn Station and connect in Secaucus Junction or take the PATH to Hoboken and get on the train there. There aren’t any bars or restaurants around the Meadowlands Sports Complex, so your pre-game fun will come via the old tailgating variety. A full list of regulations can be found online but there are a couple key takeaways. The first is that you can’t buy parking passes for two spots next to each other and park in one while using the second for tailgating. All tailgating must happen in the area in front or behind your car. The second is that grills are permitted, but open fires, deep fryers, or any oil-based cooking devices are not. Finally, footballs are allowed, so have a toss in between cars before the game. Parking lots typically open five hours prior to the game. Those fans who take public transportation to the game can take part in the "tailgating" experience, set up in the Bud Light corner outside the stadium. Fans can buy a Lobel's steak sandwich or a chicken kabob sandwich to enjoy the feeling of tailgating without all the work. Remember that NFL rules prohibit you from bringing large bags into any stadium. There is a bag check facility between Lots E and G if you forget that and need someplace to dump your bag since you took public transportation. Umbrellas aren’t allowed in MetLife Stadium either. Small clear, plastic bags are allowed, however, and you can even take food and water into the game. They’ll remove the cap to your bottles that are 20 oz. or smaller. 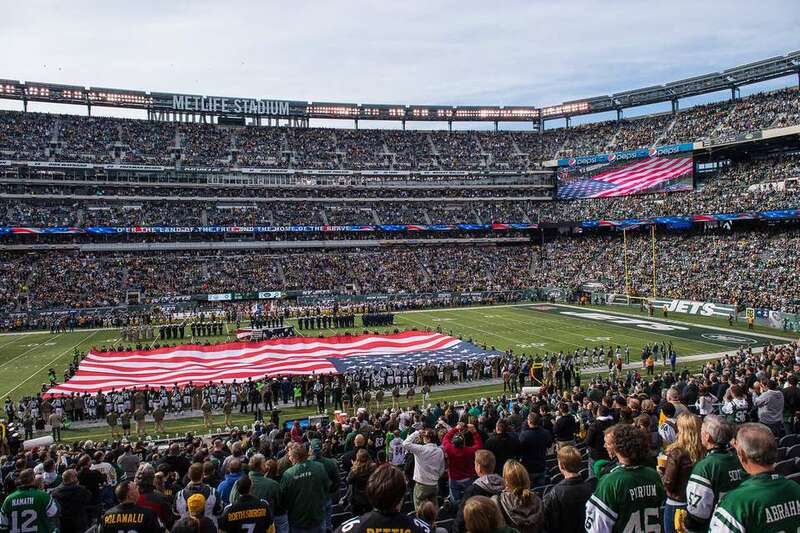 MetLife Stadium was built with the stadium concession food craze in mind and there are plenty of ways to fill you up at a Jets’ game. The best things going are the Sloppy Joes at the Food Network stand near sections 118 and 338 and the Buffalo Mac N Cheese isn’t bad either. Those in New York City know the name Lobel’s for its meat and their steak sandwich sold near sections 121 and 338 is up there with the Sloppy Joe. The "Home Food Advantage" food court area between sections 137 and 140 at MetLife Central is a nice touch, offering a wide variety of food carts serving up an Asian, Mexican, Italian and another fare. Some of the items are also available in other areas around the stadium. Nonna Fusco's Meatballs sandwich are the most popular item in this area, inspired by the grandmother of MetLife Stadium chef Eric Borgia. Steamed buns filled with pork and chicken, served with Sriracha aioli and pickled slaw isn't a bad option either. Some people also enjoy the grilled cheese, made with a nice chunk of cheese between two pieces of Texas toast. Bacon on a stick is as great as it sounds with both items being sold at the Classic Stand at MetLife Central. Hotel rooms in New York are as expensive as any city in the world, so don't expect to catch a break on pricing. They’re pretty expensive in the fall during football season, especially the closer you get to the holidays. There are numerous brand name hotels in and around Times Square, but you might be best served not staying in such a highly trafficked location. You're not that bad off as long as you're within a subway ride that takes you near Penn Station.‎ Kayak can help you find the best hotel for your needs. Travelocity offers last minute deals if you're scrambling a few days before you attend the game. Alternatively, you can look into renting an apartment via Airbnb.